There are plenty of things you cannot control in a business. From market downturns to internal issues and scandals, it can sometimes feel like you are just along for the ride when it comes to your company’s circumstances. However, there is one very important thing that any executive can control: Their Brand. This type of personal branding can have a vastly wider reach than companies do when it comes to sharing content. In fact, most executives are able to connect with an impressive 561% more people than their business does through social sharing channels. This kind of reach is influential for a growing business. Leveraging your own executive brand provides incredible opportunities for ongoing success. Here are four ways executive branding can help your business reach the next level. As you position yourself as a leader within an industry, it can significantly help to boost your company’s reputation. It is a concept along the same lines as influencer marketing; if an audience is engaged with you, they are likely to engage with your business as well. Some names and businesses seem to go hand-in-hand because of this type of executive branding. For example, when you hear the name Virgin Airlines, who do you automatically think of? What about Facebook? Of course, most people instantly associate those business’s CEOs with their brand because of the influence they have over their companies, and their respective markets. This type of association can be beneficial for you and your business because consumers are basing their opinions off of the both reputations as a package deal. In order to create this type of instant recognition, it is important that you be consistent across your chosen channels so consumers can easily identify the association. Of course, there will always be the looming risk of controversy tied to this concept. In 2016, John Stumpf, CEO of Wells Fargo, who spent much of his career boasting and preaching about aggressive sales tactics, was under fire for opening accounts for customers without their consent. In the process, Stumpf was more or less exposed for deceitful business practices. So much that Senator Elizabeth Warren described his actions as “gutless leadership.” Needless to say, the events took a huge toll on not only Stumpf’s executive brand, but Wells Fargo as a whole. Executive branding can be an incredibly powerful tool. However, great reward does not come without great risk. A HubSpot study found that by building a community of followers, 80% of marketers experienced a boost in website traffic and search engine rankings. Additionally, communities serve as a powerful platform that can result in passionate brand ambassadors. By creating an online community through executive branding, it will encourage members to share personal experiences, ask questions, engage in conversation, and contribute to a widespread pool of shared knowledge. All of this can help market your business and draw in new customers, partners, advocates, and more. Take Elon Musk’s executive branding tactics as an example. He has an immensely passionate community of followers who support his business endeavors in every capacity. Due to his reputation as an entrepreneur and profound visionary leader, his community of followers are not shy about promoting his unique wisdom. This is because they strongly believe in his values and drive. Building a community is a slow process. However, the benefits cannot be overstated. The key is using your branded content to provide insightful messaging that improves the lives of your audience. The result creates value for you, your followers, and your company. An executive branding strategy can make all the difference in your career. It can help build your status as a credible source of information in your industry by sharing knowledge, intuition, and personal experiences. Named one of the top online influencers in the world, John Rampton, founder of invoicing company Due, is an entrepreneur, featured writer, and consultant that used personal branding as a primary vehicle to build both his reputation and company concurrently. The key to reaching this status is to establish your niche and use your expertise to create credibility. By sharing your experiences and knowledge, you have the ability to influence and inspire others to apply these insights to their own endeavors. In the process, this credibility is reflected in everything you put your name on. One of the most important qualities you want to establish through executive branding is trust. 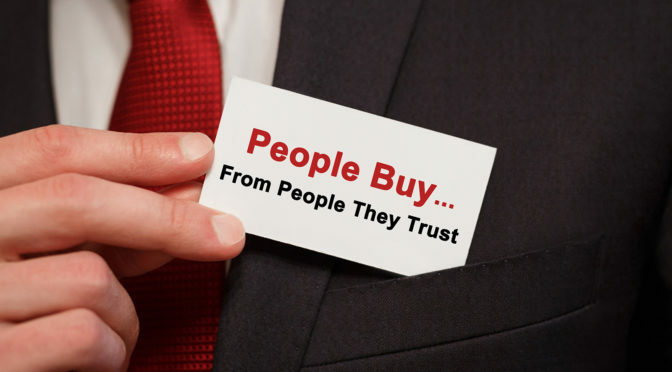 Consumer trust is powerful and absolutely essential when it comes to sales. Customer loyalty is largely influenced by trust, with consumers agreeing that it is an essential element. At the end of the day, people want to buy from other people. By utilizing an executive brand strategically, you can do a lot to humanize your business. Keep in mind, sounding overly promotional or agenda-based can hurt your efforts. In fact, studies have found this can decrease a customer’s trust in your content by 29%, as reported by a Kentico survey. Throughout everything you share about your company, or industry as a whole, give it personal twist. Be authentic in your messaging and promote your passion organically. Today’s consumers don’t get misled. If your personality has a whiff of phoniness, it will stick out like a sore thumb. Always be sure you and your business have a clear goal in mind before you set out on your executive branding strategy, for the development will be more or less parallel. Understand what sort of impact you want your efforts to make. Of course, branding is a marathon, not a sprint. Persistence is key, no matter if you are getting immediate results or not. If you are willing to put in the time and effort to spread your wisdom, you will see results before you know it.